Unity of the Spirit must be present in every church, for physical and spiritual growth to occur. The Bible gives us specific instructions about unity. I believe seeking God for unity, by praying the Word of God, will cause Him to to unify the local body of Christ. 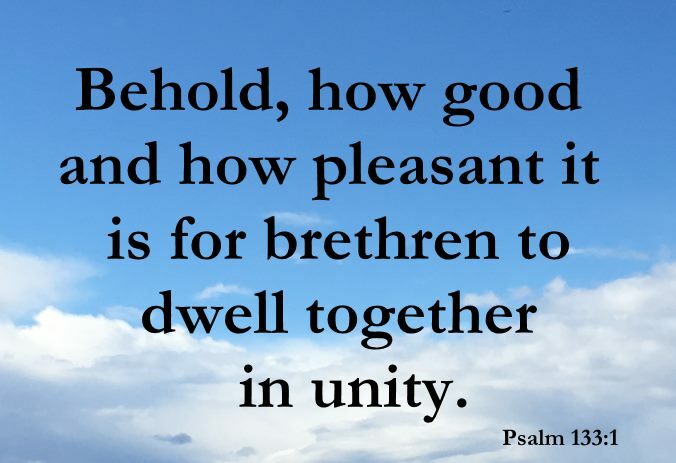 Lord your Word says “Behold, how good and how pleasant it is for brethren to dwell together in unity (Psalm 133:1)!” Oh God, help us endeavor to keep the unity of the Spirit in the bond of peace (Eph 4:3), at ______________ in ______________. Let us not be carnal and walk as men which would cause envying, and strife, and divisions among us (1 Cor 3:3). By Your name Lord Jesus, let us all speak the same thing so we are perfectly joined together in the same mind and in the same judgment (1 Cor 1:10). Let us be perfect, be of good comfort, be of one mind and live in peace; so that You Jesus, the God of love and peace, shall be with us (2 Cor 13:11). Please Lord help us have compassion one for another, love as brethren, have pity and be courteous to each other (1 Pet 3:8), never repaying evil for evil, or never paying back an insult with an insult, but instead with a blessing: knowing that is what You called us to do so that You will grant us a blessing (1 Pet 3:9). For if we love life and want to see good days, we must keep our tongues from speaking evil, and our lips from telling lies (1 Pet 3:10). Help us Lord always turn away from evil, doing good instead, seeking peace, and working to maintain it (1 Pet 3:11). For we know that Your eyes Mighty God are over the righteous and Your ears are open unto their prayers: but Your face is against those that do evil (1 Pet 3:12). Lord as the elect of God, holy and loved by You, help us put on daily tender-hearted mercy, kindness, humbleness of mind, meekness, and patience (Col 3:12); always forbearing one another, and forgiving one another as You forgave us (Col 3:13). Above all Lord help us put on love, which binds us in perfect harmony (Col 3:14). And Lord, let Your peace rule in our hearts, as members of one body; and let us always be thankful (Col 3:15). Let Your word dwell in us richly in all wisdom; let us teach and admonish one another in psalms and hymns and spiritual songs, singing with grace in our hearts to You Jesus (Col 3:16). And whatsoever we do in word or deed, let us do all in Your name Lord Jesus, giving thanks to God and the Father by You (Col 3:17). And let us be of one heart and of one soul (Acts 4:32): and let us continue daily in one accord with gladness and singleness of heart, (Acts 2:46) until we all come in the unity of the faith, and of the knowledge of the Son of God, unto a perfect man, unto the measure of the stature of the fullness of Christ (Eph 4:13). In the name of Jesus Christ, we pray for the unity of the Spirit at ______________ in ______________.